Warning, before we even get started here! 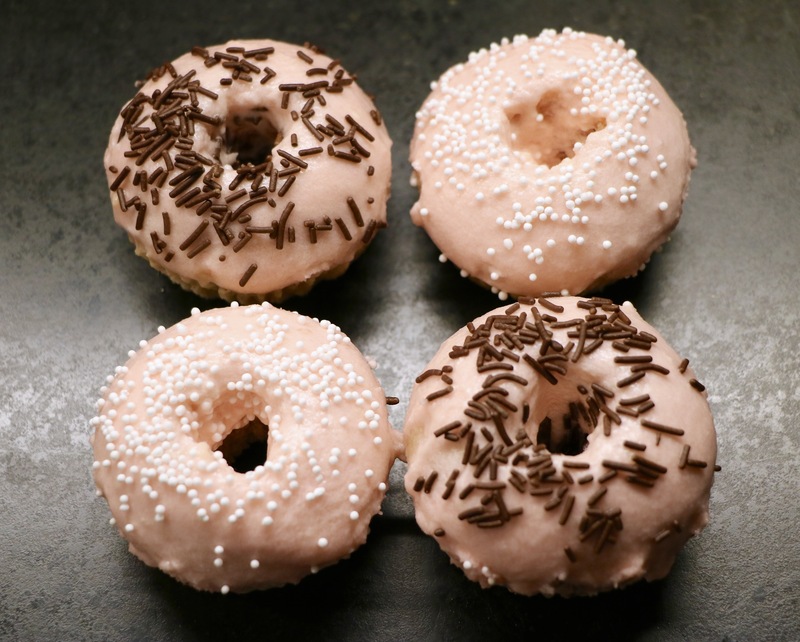 These donuts are sooooo addictive, they are incredibly delicious, sweet, fluffy and dangerously guilt free that you just won’t be able to stop eating them! They are the utmost perfect Valentine’s Day dessert to make with or to surprise your loved one with! Or, if Valentines Day isn’t for you and your planning that girls night full of Netflix and sweets, swap the Ben & Jerry’s for these, I swear you will not be disappointed! 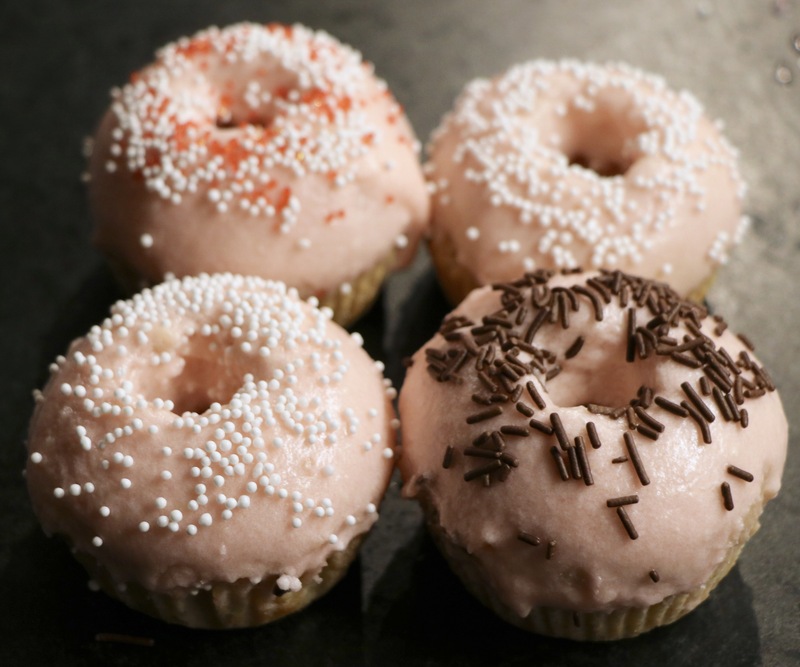 For the donuts themselves, I have both a vegan and non-vegan version for you (the only real changes would be the butter and eggs) and for the glaze, I first tried out a vegan recipe and let’s just say …. it went terribly wrong. So for the glaze that is pictured in the photos, I went for a full fat non-vegan version, since I have had no luck so far with my vegan glaze recipe attempts! But it you have found one that works for you, let me know and I will definitely give it a try!! PS. Don’t have a donut pan?? No problem, neither do I! I used muffin tins and cut a whole in the middle of each muffin, for my donuts! As a bonus you get slightly thicker and fluffier donuts this way AND you get the added bonus of DONUT HOLES (the little whole cut out from the middle of the muffins)!! 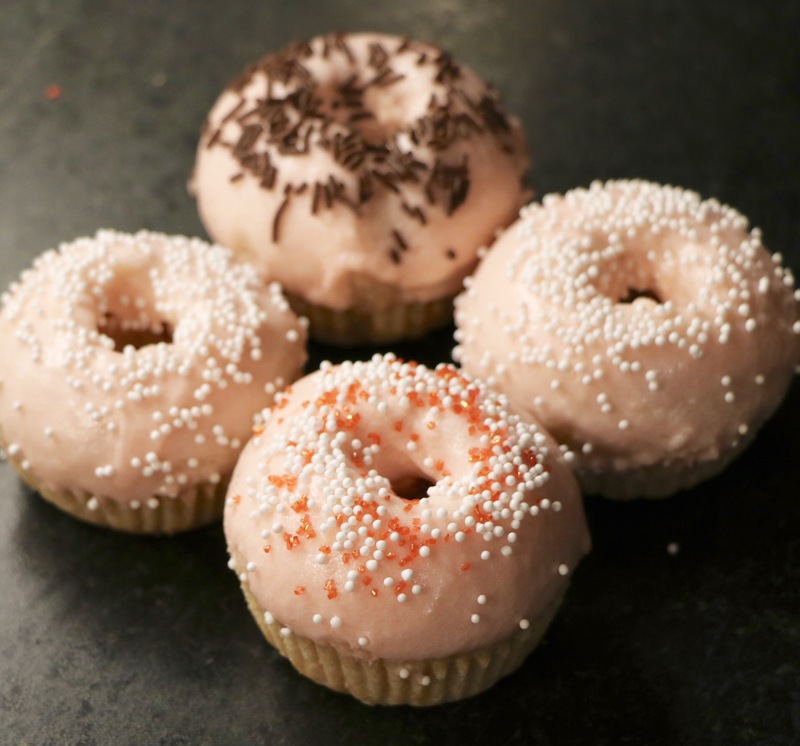 These dipped in batter are the PERFECT little treat and tester for those in the house who have been having to smell the donuts baking in the oven! Preheat oven to 350°F and line either your muffin tins with cups or grease up your donut pan. In a large bowl sift together all of the dry ingredients. Stir till combined. In a medium sized sauce pan over low heat, combine the wet ingredients. Whisk until all ingredients are melted and well combined. Slowly pour the wet ingredients in with the dry ingredients. Whisk until evenly combined. Spoon the mixture into your donut pan or muffin cups. For muffin cups bake for 25 min. and for donut pan bake for 10-12 minutes. Cool on wire rack before frosting. Once cool, cut out the centre of the muffins. Whisk all ingredients together until completely smooth (I used my kitchen aid mixer). 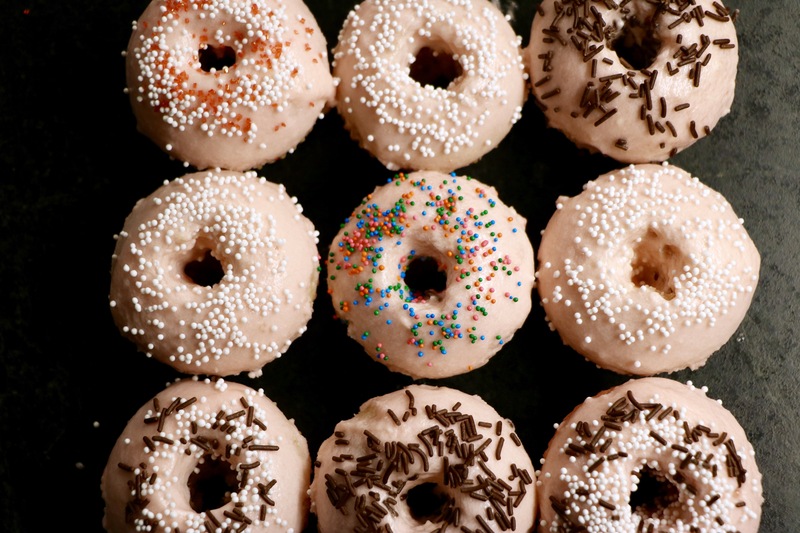 Dip each donut into the glaze and top with desired sprinkles! Make sure to keep leftovers in the fridge, the should keep for 3-4 days, or if you want a sweet that to snack on at all times, you can freeze them as well! Just de-thaw them whenever you feel that sugar craving coming on!